- Vilnius in particular is +2 for only 3 territories and just 1 border (don't let the fact it "touches" a number of other lines fool you)- I think +1 would be fairer. - all the other bonuses are very very hard to hold (especially those competing for shared territories) - and could be pushed a fair bit higher IMO (but in most games they will only come to play in the late game anyway, where there is either a clear leader or a stalemate). This is a small nitpick, but the army count for the top G station of MLO is one pixel too high. Paris D does not work with clickable maps. I had to use the drop down menu to attack from that position. 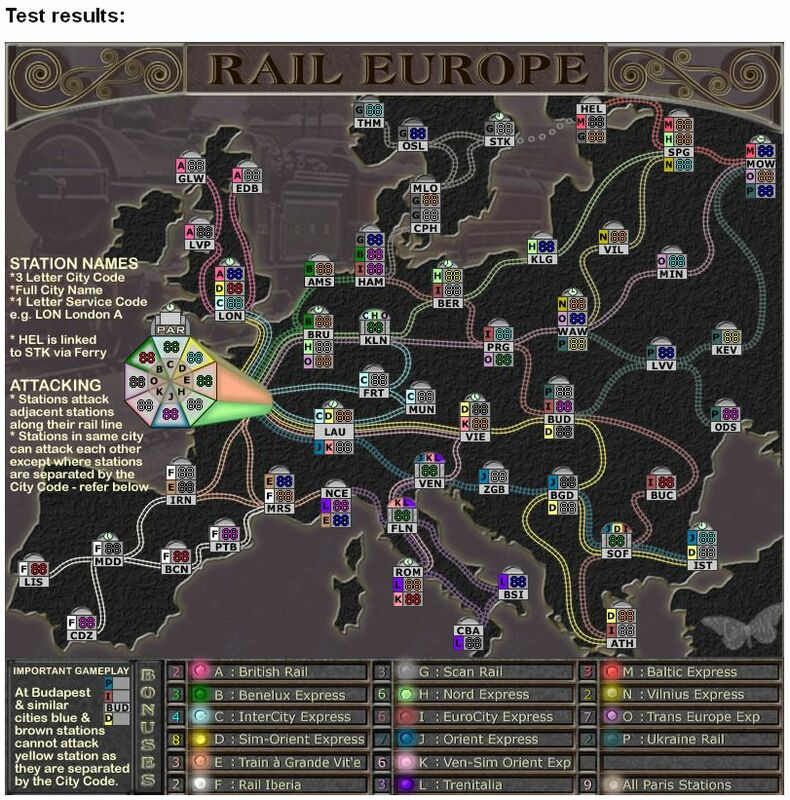 demonfork wrote: Paris D does not work with clickable maps. I had to use the drop down menu to attack from that position. Demonfork, i guess you have to see whoever looks after the clickable add-on for that one. Mmm there are discrepancies between bonuses as BENJIKAT IS DEAD pointed months ago. Baltic express has 3 territories, only 2 of them in the border and it can be attacked only from 2 outside stations. It should give a +1 or +2 bonus, not a +3, that's even more than oceania in classic risk! 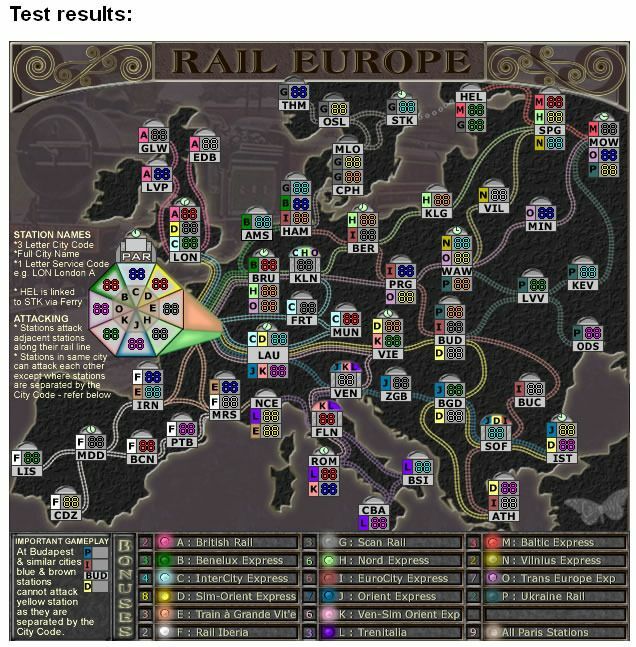 Ukraine Rail +2 bonus is OK, but a +3 bonus could work too. It's hard to conquer a 6 territories bonus to only get a +2. fumandomuerte wrote: Mmm there are discrepancies between bonuses as BENJIKAT IS DEAD pointed months ago. Baltic express has 3 territories, only 2 of them in the border and it can be attacked only from 2 outside stations. It should give a +1 or +2 bonus, not a +3, that's even more than oceania in classic risk! I won't change the bonuses on the say of one or two persons. You know that. Get other lots of support to have this change and it has a fiar chance of happening. cairnswk wrote: I won't change the bonuses on the say of one or two persons. You know that. I have to agree about the Baltic Express. 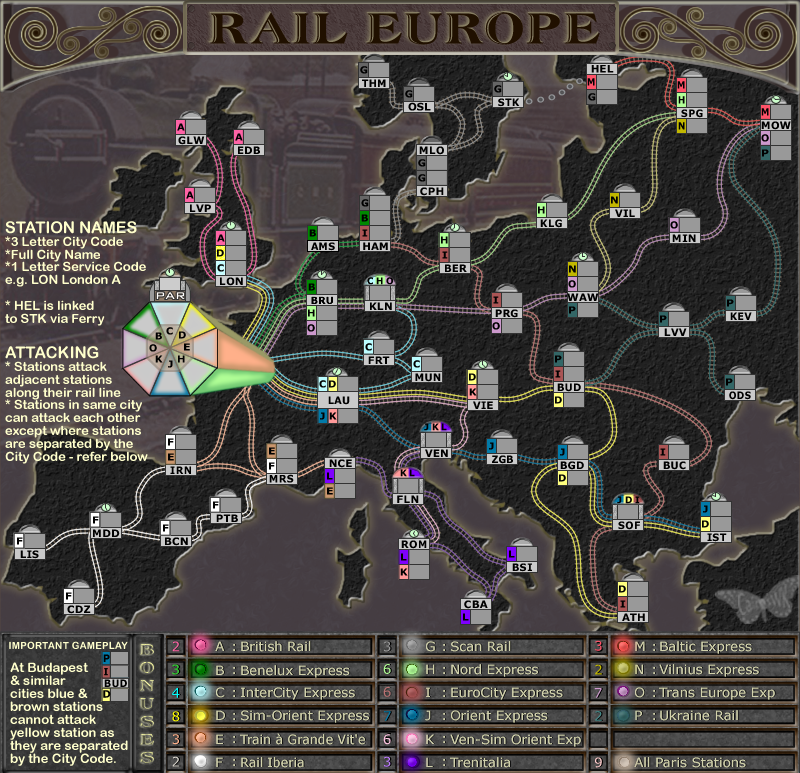 I sometimes think this game should be called Baltic and Vilnius Express for the WIn. While Baltic Express has been good to me in my games, it all depends on the drop so I wouldn't mind a change.. I'm in favor of leaving it as it is. I mean, yeah, the bonuses are a tad unfair but that's part of the game. I believe 3 armies is too much for M bonus, sorry I dunno if this was discussed somewhere already. can somebody plz explain why is M bonus +3? bcuz it has 2 borders and N and A have only 1? kinda makes P +2 with twice as many lands and also 2 borders ridiculous? Guys, i'll have another look at all the bonuses on this map again over Christmas. cairnswk, I would rather you did not. Whilst it is not played by me a lot, it is one of the funny maps that is not perfectly balanced and bland. I like the fact we have some maps like this. Just my thoughts on this issue. koontz1973 wrote: cairnswk, I would rather you did not. Whilst it is not played by me a lot, it is one of the funny maps that is not perfectly balanced and bland. I like the fact we have some maps like this. Just my thoughts on this issue. Thanks koontz for that vp. 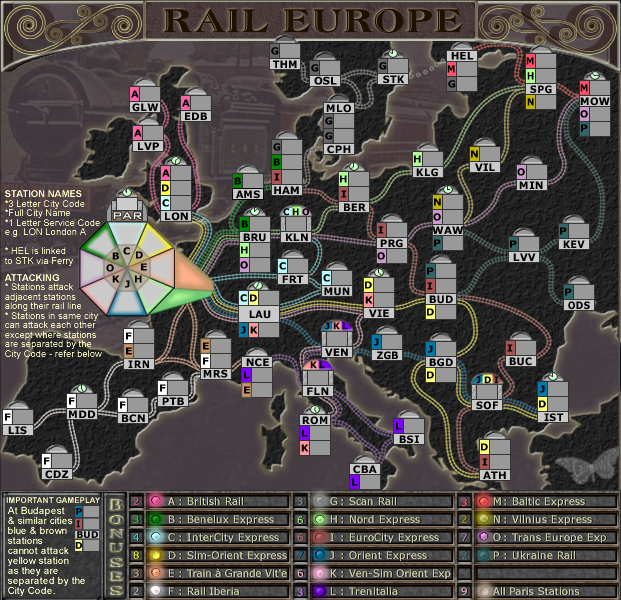 Rail Europe is my all time favorite map. And as much as I've always enjoyed the M-bonus against people who didn't see the value of it, I can't say it's very balanced. Because there a lot of bonuses, I think it wouldn't harm the map to make the M-bonus worth 2 troops, instead of 3. I'm a big fan of the map as it is, so I don't really care if it's changed, but I thougt I might add to the conversation that it's indeed an unfair bonus. Are these rail lines any better?? I believe they are! Good job cairns! isaiah40 wrote: I believe they are! Good job cairns! ManBungalow wrote: I like it.